Ezugi Live Blackjack has a very good Blackjack product. In fact their game is as close as it can get to being perfect for me rules wise. Ezugi Live Blackjack is an 8 deck game played to Vegas rules where the dealer takes two cards. 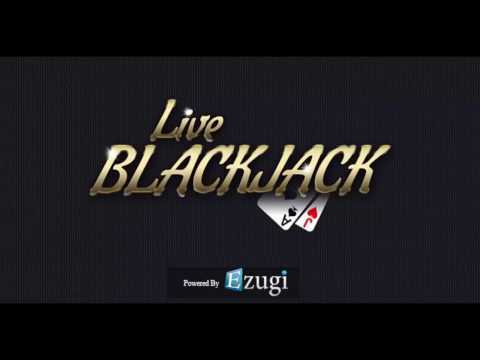 Ezugi Live Blackjack is an 8 deck game played to Vegas rules where the dealer takes two cards. Unlike most of the other live blackjack games out there you can double on splits and Surrender your hand if the dealer is showing an Ace. There are no limiting rules applied to the game, they have the best bits of all the rule variations. If you could split an already split hand it would be perfect. Here at TopLiveCasino UK, we found that the tables all look the same with the only real difference being the stake levels and the language spoken by the dealer. The core game is endlessly entertaining, plus added-value features such as Pre-Decision, Side Bets, and Bet Behind quicken the pace and give not only the ‘seated’ player the option to win some, but many more players. Players will have access to the full selection of tables in the Live Lobby. Friendly, professional dealers greet players and interact throughout the game. There is only one camera view of the table. But this does keeps things simple. Downside of this is there is no cut down version for times when you may be suffering from a slow connection. However the streaming quality can be controlled with the default being set at Auto. You can also manually select High or Low depending on your circumstances. Sound levels can be adjusted using the volume control and the Information button displays the full game rules in a pop out window. There is an option that will enable you to chat with the dealer and the chat window can be minimised by just setting the onscreen option. Playing statistics for you and the dealer can be displayed by using the History option, which can come in handy if you play via a strategy or thinking of it. Perfect Pairs and 21+3 side bets are available at the table, So the nice people at Ezugi allow you to switch the display off if you don’t want to see them. Payout information is displayed if you click on the stakes plaque. A separate window will open where you’ll see all the payout information displayed. Ezugi Live Blackjack is good, but simply not as good as Evolution Gaming. Mainly also due to the amount of variantion and software used.